McCain Irrelevant, 'He's Dying Anyway,' White House Official Reportedly Says : The Two-Way The remark, attributed to Kelly Sadler, a special assistant to President Trump, was first reported by The Hill and later confirmed by The Associated Press. Sen. John McCain, R-Ariz., pauses before speaking to reporters during a meeting of the National Defense Authorization Act conferees in Washington. A day after Sen. John McCain urged his Senate colleagues to reject Gina Haspel as CIA director because she had overseen torture of detainees, a White House official reportedly mocked the ailing Arizona Republican, saying his opinion "doesn't matter" because "he's dying anyway." The Hill first reported the comment later confirmed by The Associated Press. Both cited unnamed individuals in the room when the disparaging remark was made by Kelly Sadler, a special assistant to the president. White House spokeswoman Sarah Sanders declined to say Friday whether Sadler made the statement: "I'm not going to comment on an internal staff meeting." She confirmed that Sadler still works at the White House. McCain, 81, who has incurable brain cancer, issued a statement on Wednesday calling Haspel's role in torture "disturbing" and "disqualifying" for the top CIA job. On Thursday, Cindy McCain tweeted at Sadler: "May I remind you my husband has a family, 7 children and 5 grandchildren." And on Friday, his daughter Meghan McCain, one of the hosts of daytime talk show The View, responded to Sadler on the program, saying, "Don't feel bad for me or my family." The White House did not dispute the remark attributed to Sadler but said in a statement, "We respect Senator McCain's service to our nation and he and his family are in our prayers during this difficult time." The reported remark by Sadler, a former opinion writer for the conservative Washington Times, came on the same day that a retired three-star general told Fox Business Network that the torture McCain endured as a prisoner of war in Vietnam "worked." 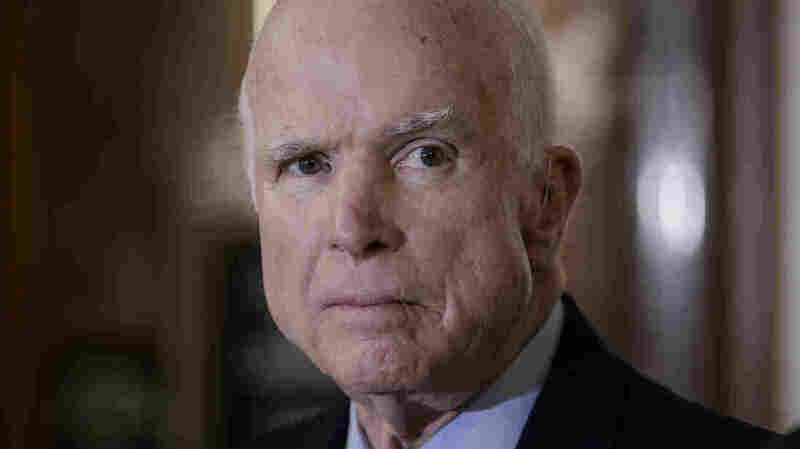 "[It] worked on John [McCain]," retired Air Force Lt. Gen. Tom McInerney told Charles Payne of Fox Business Network on Thursday. "That's why they call him 'Songbird John,' " he said. The claim that McCain — who was imprisoned in the infamous "Hanoi Hilton" after his Navy A-4 was shot down over North Vietnam in 1967 — had collaborated with his captors has received a "pants on fire" rating from PolitiFact. PolitiFact, in a report from 2008, said there was "scant evidence to back up the claim and it is strongly contradicted by many other accounts ... [including] interviews with other POWs, an author who has written a McCain biography and the senator's own accounts." The comment by McInerney — who has been a proponent of the debunked claim that President Obama was born in Kenya and once suggested that Islamist sleeper agents might be embedded in the Obama White House — went unchallenged on-air by Payne. The host later apologized for the oversight, saying on Twitter that he "had the control room in my ear telling me to wrap the segment, and did not hear the comment." "As a proud military veteran and son of a Vietnam Vet these words neither reflect my or the network's feelings about Senator McCain, or his remarkable service and sacrifice to this country," Payne tweeted. During the presidential campaign in 2015, then-candidate Trump — who received multiple academic and medical deferments to avoid the draft during the Vietnam War — said McCain was only considered a war hero "because he was captured," adding "I like people who weren't captured."